do you remember a few weeks ago when i told you about my new headboard? i made promises to show it to you. then my totally unruly perfectionist personality convinced me the room just wasn't pretty enough yet to blast allover the internet. i listened for a while in hopes that somehow in the midst of my busy schedule i'd get it "pin worthy" then i'd post about it. yeah, about that, i gotta stop that! "pin worthy", that's too much unnecessary pressure. somebody please tell me to calm down already. 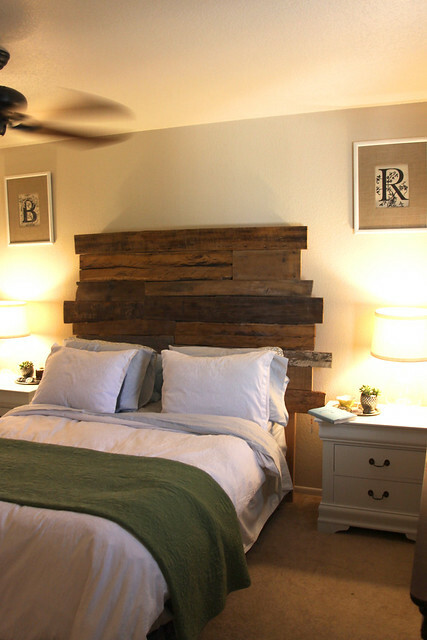 so here is our bedroom and the new headboard in all her rustic reclaimed glory. isn't she a beaut?! she's gorgeous! i couldn't be happier. it is exactly what i was hoping for & more. my husbands dad is a contractor for million dollar custom home remodels. needless to say his clients are always remodeling their homes in the most beautiful ways. sometimes there are scraps of sorts that get tossed into the dump pile. also, sometimes said scrap pieces really aren't dump worthy at all. so, he takes them, with permission of course and reuses them or gives it to folks who could. 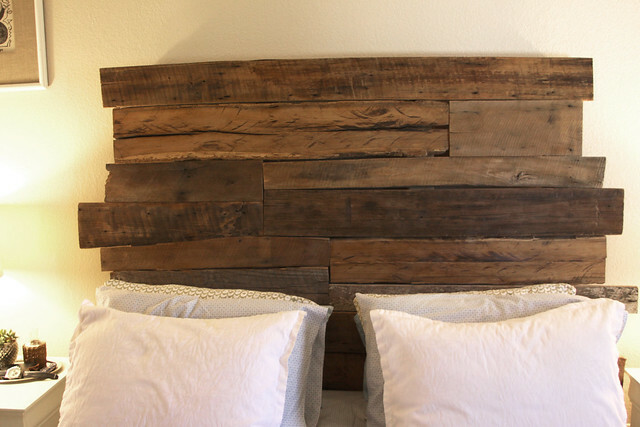 when we decided we wanted to make a rustic headboard we knew who to ask before we bought anything. it just so happened that one of the homes he is working on is being overhauled with old barn wood in many places. i.e. floors, walls, beams. a total rustic wood junkies dream. they had a few scrap pieces of 200 year old barn wood left over that we could take. we took, we made, we love. we were inspired by the measurements of this headboard. but on laying out the pieces we decided we liked the look of the boards shooting out unevenly rather than that of a perfectly even frame. we felt it looked more custom and authentic to the rustic feel we were going for. i'm so happy with how it turned out. every night i crawl into my bed and feel like i'm in the beginnings of my very own anthropology bedroom. Bex it's beautiful! And totally pin worthy! I love the way it turned out! OMG ITS AMAZING!!!!! Did you guys seal it and stuff? Its perfect!!! I would love to give this a try for our bedroom! It looks amazing!!! Great job guys! So glad that it gives you a little smile every night! Your headboard looks so cool. It is definitely "pin worthy"
i LOVE! that is so creative, and unique. and what a score with your father in-law scrapping a whole barn! I also adore your initials above your bed-side tables. did you make those too? its so fabulous! Well done you guys! Its totally pin-worthy! i have a pile of scrap wood saved for my own headboard, someday i'll actually assemble it! totally pin worthy! Love it!! defiantly very anthro! Just pinned it! Your lamps and coverlet has provided me with some inspiration for my own bedroom remodeling. It is beautiful! I don't think you have the "makings" of your very own anthropologie bedroom...you spot on have it! 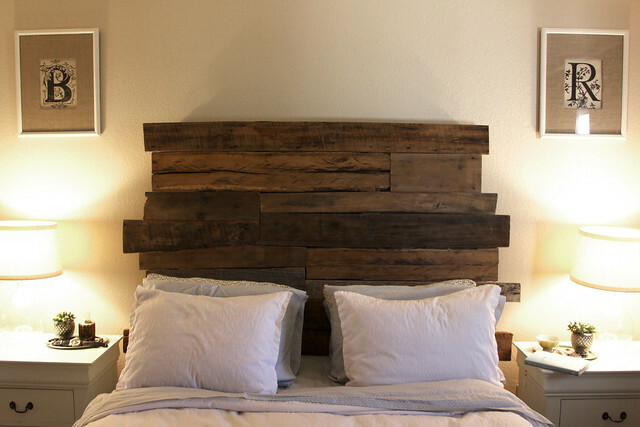 Cool DIY headboard! I made a headboard too a few weeks back! They are so much fun! Omg... that has to be one of the most gorgeous headboards I've ever seen!!! I wish there was a place I could get old barn wood around here. I'm dying to make a rustic kitchen table & benches. You bedroom is stunning! Love!!!! I love it! your bedroom is so pretty!